Welcome to the SJS Style Bible Issue 2, where we’ll share another one of our favourite projects and show you exactly how you can recreate the look in your own home. If you’re looking to reinvigorate your living space and give it much needed love and life, keep reading because we’ve made all the difficult choices for you. All you have to do is enjoy your new space! As some of our suppliers are “trade only”, we’ll be offering these to you directly through our own website. For other items, we’ll connect you with the supplier, so you can purchase them direct. Light, airy and relaxed; three key driving words behind our Freshwater project. 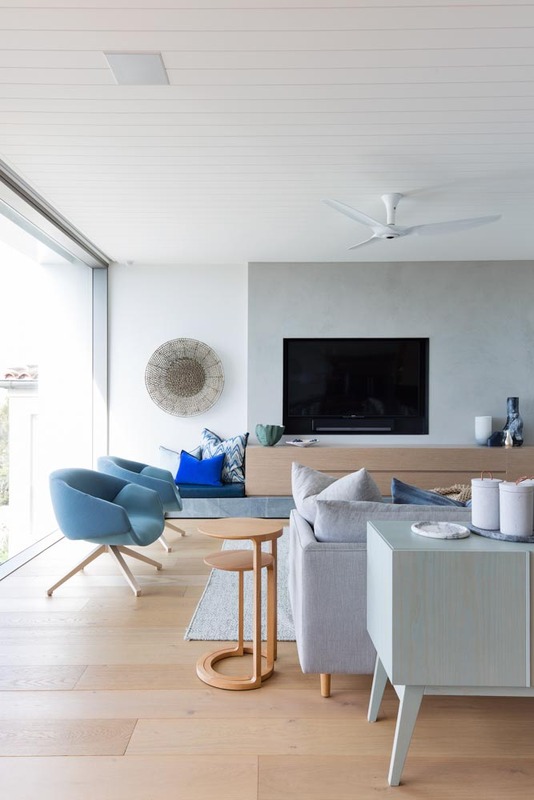 This space was brought to life with layered textures including marmarino, natural stone and timber to ground the space whilst incorporating contemporary furniture and furnishings to create softness. By combining all these individual elements, we were able to inject depth and personality to create a beautiful family home! Texture on texture! Stucco is a speciality paint finish that elevates any basic wall. It’s versatile, very customisable and one of our favourite finishes to use!. An armchair is a flexible and dynamic seating option, and we love these two options! It’s fun to play with upholstery on a smaller scale too, with rich tones to contrast the lightness of the surrounding space. Scatter cushions give you the opportunity to add playful textures and colours into your space. These options feel rich and luxurious and add an extra layer of detail and personality to your home.